OUR VERY OWN RADIO SHOW !! WE ARE BACK. . . .
Well this is going to be interesting Radio Woking (one of our media partners) have given us our own show for one week which shall be repeated several times up to Undercover… what have they done did they not learn their lesson from the bedlam of last years shows. . 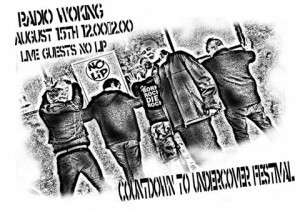 PRESENTED BY MICK M FROM UNDERCOVER FESTIVAL – Ably assisted by “LOCAL LEGEND” MURPH one of the Radio Woking stalwarts, the Friday show with his cohort Mabbs who are both an integral part of Undercover Festival as well. . . . . Spinning tunes by many of the bands playing Undercover Festival and a few from the past as well – pus a few dodgy favourites of Mick. . . .
We were offered more shows but we don’t have the time to do more – sorry. . .
What is in store for Radio Woking and the fair people of the area in store – we shall see…. SO WHO ARE NO LIP?